You should have arrived from Rebecca Ann. If not, Connie Can Crop, is the beginning of this interactive hop! For my card I thought it would be fun to make a wreath. I cut a 3 3/4 inch square panel of white card and placed it into my MISTI with the Gina K Wreath Builder stencil. I then stamped out a wreath using the raindrops, cloud and umbrella stamps from Skull and Cross Buns Spring Motifs stamp set. After I’d completed my stamping I quickly coloured the images in with my Spectrum Noir Illustrator markers. Setting the wreath panel aside I worked directly on my card base to create a background. I used the raindrop stencil from Skull and Cross Buns and ink blended over it with Tumbled Glass Distress Oxide to create a raindrop background. I shifted the stencil and added another layer of raindrops with Stormy Sky, and again with Mermaid Lagoon. I white heat embossed a sentiment from Simon Says Stamp’s Showers and Flowers stamp set onto a snippet dark blue card and adhered it over my wreath. I then adhered the wreath panel to a larger snippet of the same blue card. Finally I adhered the matter wreath panel onto my rain drop patterned card base. Whilst it wasn’t exactly how I’d imagined when I started the card, I am really happy with how this turned out. I think it works nicely for a rainy design, don’t you? I am the last stop on the hop, but if I’m the first stop you landed on, or if you started partway through the list, you can head over to Connie next to continue hopping! OMG what a clever creation!!! Love it! Thanks so much for joining us at The Sisterhood’s ‘April Showers’ challenge. Please come back again soon and Good Luck! I love your creativity! I looks so hard but your description makes it sound do-able! Thank you so much! WOW!! Very creative card. GREAT job. Awesome card. Love how you used the wreath building set for the umbrellas and sky. That raindrop background is perfect. What a great idea for this hop! I love it! You made me want the wreath builder LOL! Awesome job! Thank you! 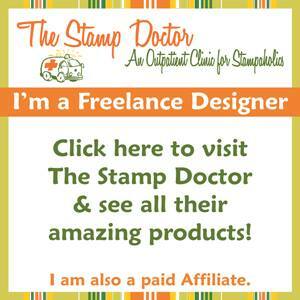 I’ve got a lot of use out of mine – very glad I invested in it! What a great card, awesome wreath effect. Love that sentiment too. Your card is so adorable! I love the little umbrellas! They are so cute! Love the look of your card. Most of my cards never turn out the way I plan. Great card! Signed up to follow you. What a fun idea to make a rainy day wreath! The umbrellas add a pop of color to your design! 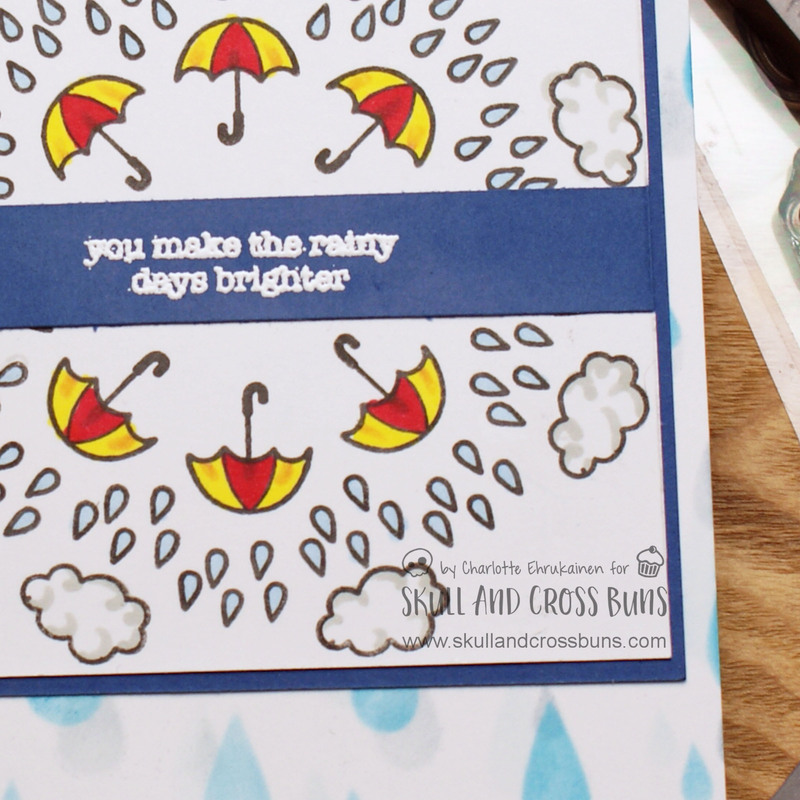 What a cheerful card for a rainy day! I’m so happy you played along in the “Use a stencil” Challenge over on The House That Stamps Built! Love how you’re images form a circle. Great colouring Charlotte. Love that rain drop background too. This is so creative and fun! The wreath design is cheerful and so full of energy! Hi Charlotte. This is a beautiful card. perfect card for the hop! great job! How cute!!! I LOVE your rain/umbrella wreath! I’ve just been watching some videos on using the wreath builder template; it looks so awesome! 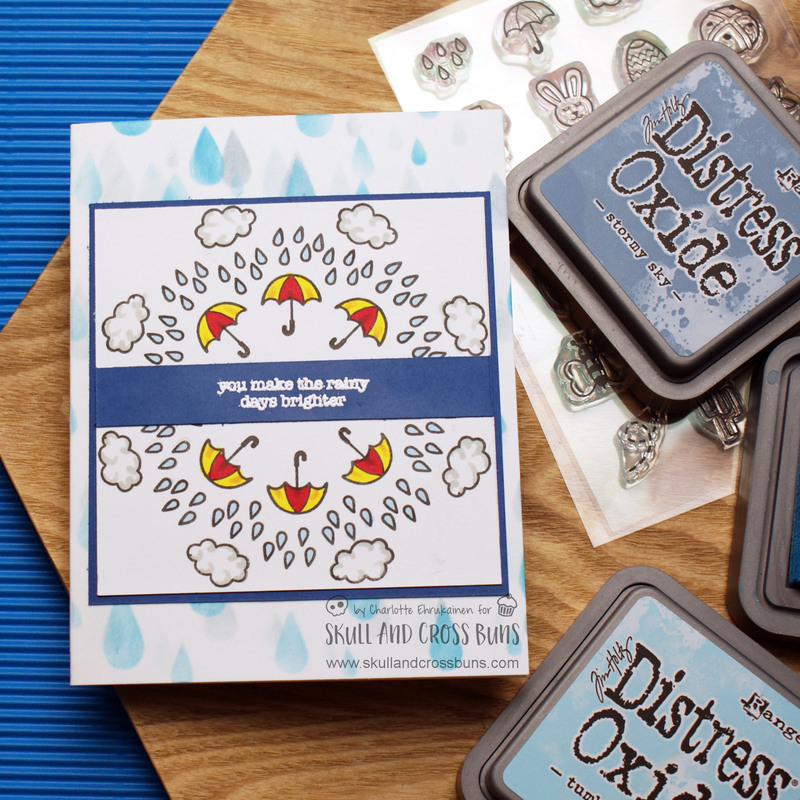 And your stenciled raindrops are perfect! Thanks for playing with The House That Stamps Built. I just love this card! It’s so fun and creative to make them a wreath!! Fabulous end to the hop!! Love the wreath of the images. Cute card. Adorable card with the wreath builder! Cute images! This is just Adorable! Very creative! Great job! April showers have never looked such fun before! Fabulous card Charlotte. Thanks so much for playing at Uniko, hope to see you joining in with future challenges too. What a fun card!! Great teardrop background!! Sorry I’m so late to comment. Awesome card.Thanks for joining us at Polkadoodles Crafting Challenge.